Mt. Desert Island, Me. – America’s National Parks may be the most popular project of the federal government, but they have been shaped less by the planning of politicians than by the generosity of millionaires. Here Rockefeller hiked amid the rocks and woods Longfellow called “the forest primeval,” and came to know every inch of his growing estate. But Junior, as he was known – his father, John D. Rockefeller Sr., was the wealthiest man in the world - didn’t view the land as his alone. Like other leaders in the golden age of conservation, he believed wilderness was good for the soul, and that all people should have access to it, not just the elite. At the turn of the 20th century, Bar Harbor - the largest village on Mt. Desert Island - was the elite’s summer address. Rockefeller worked with his neighbors to assemble most of the undeveloped parts of the island – including 10,000 acres of Rockefeller’s land – to preserve them in their natural state. The millionaires donated the land to the federal government to create the national monument that eventually became Acadia National Park. If only we had millionaires like that today. Actually, we do. Unlike Rockefeller, Roxanne Quimby didn’t inherit her wealth. Raised in suburban Boston, she went back to the land in 1975, looking for a life that was more free, more pure. A few years after moving to northern Maine, Quimby started selling beeswax candles with a friend at local fairs, a partnership that grew into Burt’s Bees, maker of personal care products for nature lovers. In 2007, she sold the company to Clorox for $970 million. Like Rockefeller, Quimby envisioned a national park in Maine. 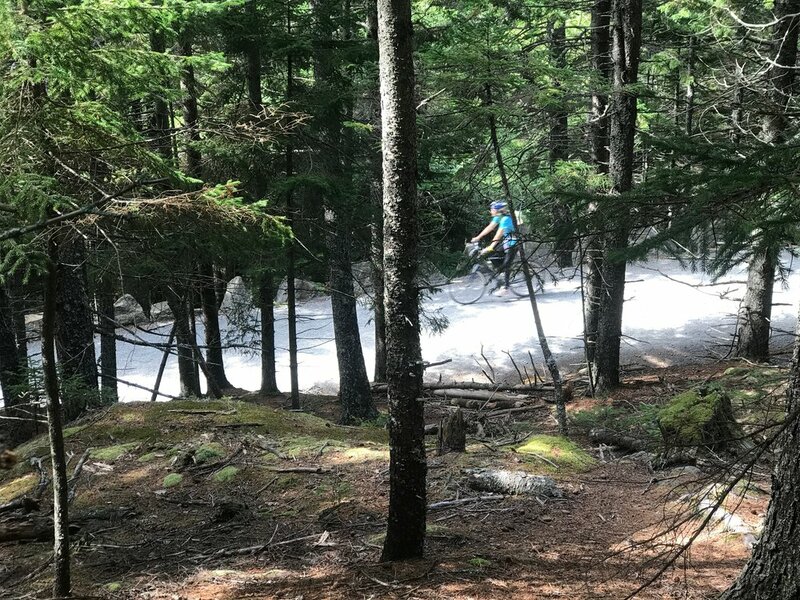 She quietly bought up 87,000 acres of forest adjoining Baxter State Park and donated them to the federal government for the creation of Katahdin Woods and Waters National Monument. Rockefeller understood that Americans like to appreciate nature while moving through it. To Mt. Desert Island’s extensive network of hiking trails, he added 57 miles of carriage roads. Road-building was a hobby for Junior and for his father, a ranger explained, and Rockefeller personally designed and supervised the project. Rockefeller thought the horse-and-carriage set just the right pace for appreciating nature, but I walked them on foot. They are a joy to travel by any means. The roads wind through a landscape of grizzled trees and pink granite decorated with moss and lichen. Sensitive to the concern that rich people were buying up and closing off the best views of ocean and coast, Rockefeller incorporated view-shed points into his design. He built 17 handsome granite bridges, each of them distinct. Out of personal preference – Rockefeller reportedly hated cars – and political necessity, automobiles have always been prohibited on the carriage roads. That makes them a quiet haven for hikers, bicyclists, equestrians and cross-country skiers. Rockefeller knew cars couldn’t be kept out forever, and he appreciated that motorists had as much a right to nature as hikers. When what was called the “Rockefeller Roads” were completed, he began work on what became the Loop Road, with a paved surface and plenty of places to pull over and admire the views. You can drive right up to the top of Cadillac Mountain, the highest peak in the park, though you might find the parking lot full. It’s a different story 2 hours west, where another benefactor’s gift, the 200,000-acre Baxter State Park, is managed under rules set in 1931 by Percival B. Baxter. He wanted wildlife preservation, not human recreation, to be the priority, so its roads can never be paved, its campgrounds are primitive, bicycles and motorcycles are banned and the only way to the top of Mt. Katahdin is on foot. It’s great for backpackers, but leaves a lot of people behind. The rules that will govern Katahdin Woods and Waters National Monument, which adjoins Baxter, are still undecided. It has just one National Park Service employee assigned to it, and he’s in the first year of a three-year planning process under a political cloud: There’s still opposition to the national monument President Barack Obama created in 2016, including President Donald Trump and Maine Gov. Paul LePage. The only roads into the new park are dirt, as are the roads leading to them. But Quimby, like Rockefeller, developed a Loop Road before turning the land over to the NPS, with cleared spaces so motorists can pull over to enjoy the view. There’s always a tension between preservation and recreation. Acadia is crowded, more so now that cruise ships are discharging thousands of passengers on to the streets of Bar Harbor. Baxter is inaccessible to many who might enjoy it. The good news is there’s something for every taste in America’s parks, thanks to millionaires, activists and a supportive government.